Learning how to cook artichoke is easy whether boiled or baked. Simply core to the artichoke heart and marinate. Italians love artichokes whole with tomato sauce and Parmesan or mozzarella stuffing. Many people simply wash and boil the artichoke whole until the leaves soften and then dip them in melted butter. 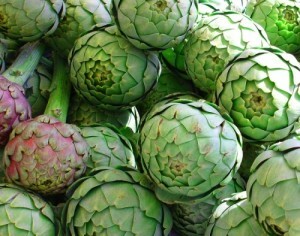 Artichokes themselves are a low cholesterol food. For the health conscious, it’s all about what you eat with the artichoke. There are also many exciting ways to learn how to cook artichoke. I’ve included my favorite below. It’s called Artichoke Le Bleu. Boil artichokes until tender. Drain and cool. Separate artichoke leaves from bottom to top. Blend blue cheese, bacon and salad dressing to a thick paste. Spoon into each row of leaves. Blend lemon juice, butter and pepper. Place on serving platter and garnish with lemon sauce. Serve warm as an appetizer or over white rice with a dry white wine.